I've recently acquired an AMS BetaBrite RGY LED board... just the main unit, no cables, no software. I was able to determine (through minor trial and error) that it used a 12V source to power it. ...I went with the latter. There's a total of 14 transistors to supply voltage to one row at a time. The reason for the 14 transistors is it's a 7-character-tall display, with 2 for each color: red, and green. Each LED board has a 2x7 by 10 display, and there are 24 pins. 2x7+10=24, which means it's a bit-shift method for sure. I'm finding ICs underneath each one, which tells me that only one LED is on at the time. 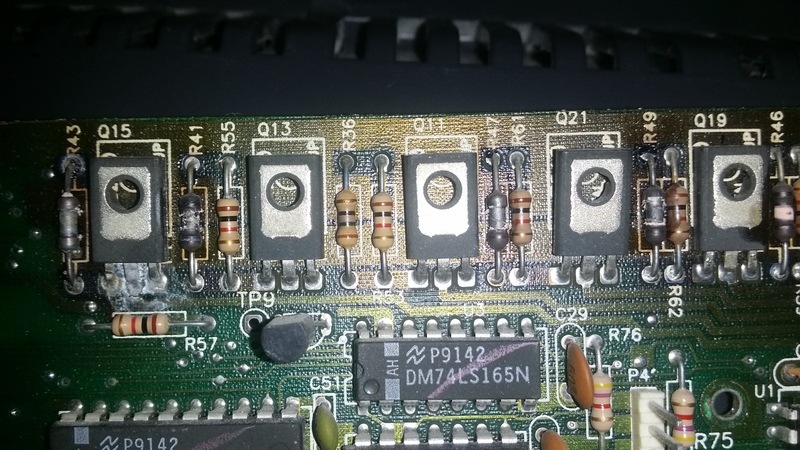 Also, this tells me that each IC (bank) on the secondary board is controlling the cathode of the LED, and the transistors on the primary board are controlling the anode. ...and many more I'll edit in once I can find them. What recommendations would you guys have? PS: I'm also not opposed to the idea of having something like a RPi0W in the design to make it easier to simply use the Arduino as an interface, and allowing the Pi to be the main control unit.